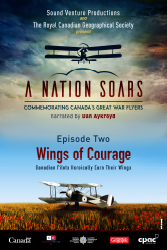 Wings of Courage: Canadian Pilots Heroically Earn Their Wings is the second in a trilogy of documentaries called A Nation Soars: Commemorating Canada’s Great War Flyers. In this second instalment, narrator Dan Aykroyd tells the stories behind the heroism of five notable Canadian pilots and the massive technological and tactical progression of aviation during the First World War. Wings of Courage premiered on CPAC November 6th, 2016. Drawn to Victory, the first documentary in the trilogy, premiered on CPAC October 30th, 2016. Both documentaries continue to be rebroadcasted on CPAC and can also be viewed on the CPAC website www.cpac.ca by entering A Nation Soars in the site’s SEARCH ALL VIDEOS to access the titles. Flight Path of Heroes, the third documentary in the trilogy, premieres on CPAC in the fall of 2017. Apart from starring in some of the biggest films of the 20th century, and being nominated for an Academy Award, Dan Aykroyd is also a musician, writer and the co-founder of the House of Blues chain of music halls and restaurants. Aykroyd, who was born in Ottawa, is also a proud Canadian. Being the Nation Soars’ proud narrator is a natural extension of his love for Canadian history and the people that shaped it. The Cable Public Affairs Channel is Canada's only privately-owned, commercial free, not for profit, bilingual licensed television service. CPAC provides a window on Parliament, politics and public affairs in Canada and around the world.